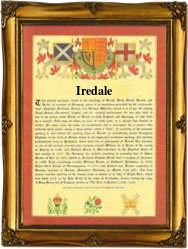 Recorded as Iredale, Irdale and Iredell, this is an English surname. It is locational and originates from "Airedale", a region of West Yorkshire north west of the city of Bradford, and surrounding the River Aire. According to the Oxford Dictionary of English Place Names, the word "aire" is a development of the Roman (Latin) "isara" meaning "strong river", and this seems a reasonable explanation. Sadly several centuries of industrial development has greatly diminshed its flow! Locational surnames are by their nature "from" names. That is to say names given to people after they left their original home to move elsewhere, usually in search of work. The easiest way to identify these "strangers" was to call them by the name of the place from whence they came. Spelling over the centuries being at best indifferent, and local accents very thick, soon lead to the development of "sounds like" spellings. In this case early examples taken from surviving church registers include: William Iredill of Hartshead, near Huddersfield, on September 16th 1632, Elizabeth Iredale of Wath on Dearne, near Barnsley, on December 10th 1647, whilst in London on June 1st 1753, Matthew Iredale married Elizabeth Roberts at St George's chapel. Hanover Square, Westminster.